Thank Sen. Collins For Voting to Confirm Judge Brett Kavanaugh! Many on the left are still up to their Saul Alinsky tactics of abuse, threats, and protesting U.S. Sen. Susan Collins (R-Maine) and her staff. Remember in the New York Times how, amongst several things, it was reported that one call came in to a staff member saying he hoped she was raped and impregnated?! Well, they are still up to it, as they were outside her home on Sunday demanding to meet with her. We Maine women are so proud of Sen. Collins and the historic, brave, and concise speech she gave on the floor of the U. S. Senate when she told America that she would be supporting the confirmation of Judge Brett Kavanaugh. Let’s stand and give an offering of thanks to the senator. Vote in the Bangor Daily News poll to show that Mainers appreciate Sen. Collin’s decision. 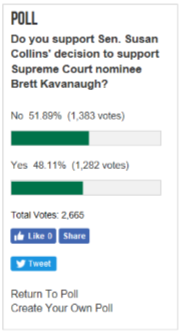 This morning the poll showed 48% in support of her decision. Write a note of appreciation to Sen. Collins via email and/or snail mail. Be sure to let her know you are a member of Concerned Women for America of Maine. Please forward this e-alert to friends and family. Our lawmakers rarely receive thanks for the work they do. We are quick to criticize, but slow to empathize or be thankful. Sen. Susan Collins is more than worthy of our thanks for her work done to confirm Justice Brett Kavanaugh. May we not be slack in well doing. Thank you. “And do not neglect doing good and sharing, for with such sacrifices God is pleased” (Hebrews 13:16 ). Partner with CWA of Maine through your financial support. We are continually grateful for those who give to the work of CWA of Maine. When you give to the state, all funds are used for state projects. To contribute your tax-deductible gift to CWA of Maine, please send a check written out to “Concerned Women for America” with “CWA of ME” on the memo line, and send to CWA of Maine, 864 Manchester Rd., Belgrade, ME 04917. Or, click here to contribute online.